Working in the accommodation and tourism industry, I know how important reviews can be to a business. I also know plenty of businesses who are still not maximising every opportunity they can to seek out guest reviews, and leave it up to fate that they will come in on their social media. I like to remove as much chance from my business as possible, which is why I take full control of asking for and getting reviews for my business. I understand that people can be shy and that you might not want to come across as pushy to your guests, but by asking them at the right time can really maximise the amount you will receive. But before we get into my top tips, let’s consider whether asking for reviews is okay in the first place. Sites such as Google are perfectly okay with you asking guests for reviews. TripAdvisor has advised that they don’t have a problem with you asking for reviews; however, you need to make sure that there’s no incentive for the review being placed (like a discount off a stay). Facebook actively encourages you to seek out reviews (and even has a pre-set box asking users for reviews of business pages). If you are ever in doubt, check out the specific review sites terms of service for what they say about asking for reviews. There’s no better way to ask for, and get, reviews than to do it in person. The person-to-person request is incredibly effective, particularly if you have spent a lot of time with your guest. I know that with my own businesses, asking for a review in person is the single most effective way that I get them, and is way better than sending out emails after they’ve stayed in the park. At the end of the guest’s stay, there is no person better positioned to ask for a review than the receptionist checking the guest out. Your receptionist can explain that it helps other guests who are researching them and gives a true perspective on the business. 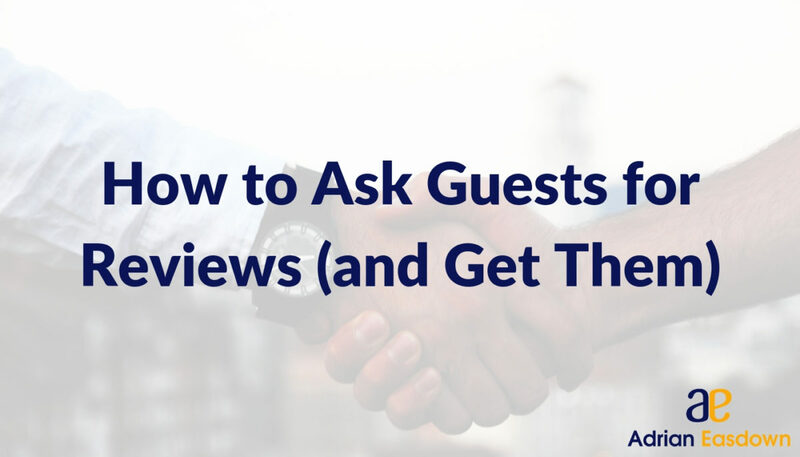 If you’re thinking about asking guests for reviews, first try to figure out the guest touch points and who within the business builds the deepest relationship with the guest. That is likely the person who should be asking for reviews. Typically, very few guests talk to you when they’ve had a positive experience from your business (as opposed to almost all of them leaving reviews if they had a bad experience). When a guest reaches out to you with a positive comment, it’s a goldmine. That guest has shown ‘initiative’. When a guest emails you (or contacts you via a form on your website) with a positive message about their holiday experience, don’t just leave a ‘thank you’ reply. Ask them politely if they’d be able to leave an honest review. The chances of them doing so is much higher than sending a mass-email to your guests. Facebook, Twitter, Instagram, etc. are turning out to be great for guests to get their issues addressed quickly. When you handle guest queries on social media, you can use that opportunity to pitch for a review. Of course, not every guest interaction on social media can be turned into a ‘get guest review’ campaign (and that’s just bad for your business). But pay just the right amount of attention to how good the guest feels after the interaction, and you will get a clear idea of which interaction can be pushed to get a review from the guest. Post on social media at regular intervals (say, once a month) asking your past guests to leave you feedback. That’s beneficial in two ways – you’ll get real guest feedback that will help your brand and you’ll also have good, positive reviews which you can then use in your business! Asking for reviews via email can be a little tricky because you aren’t in front of your guest wowing them with your stunning charm, and you run the risk of the email not being received, actioned or even read. However, for the times where you didn’t get a chance to ask a guest in person, email may be your only option. As with any good marketing campaign, test everything until you’re getting the best number of reviews being completed. Email will almost never perform as well as asking in person, but it can still be very effective response rate. The simple act of asking for reviews starts to put the power back into your hands. Many business owners just throw their hands up in the air and assume there is nothing they can do. But as you can see, it’s quite the opposite. Using these strategies, you can take charge of your reviews and get them into your hands when you need them.